Good News For Current iPhone Users! Okay, so I've only just recently mopped up the aneurysm from my post last week about the tricky iPhone subsidy. I have confirmed with AT&T that if you are a current iPhone user, you WILL qualify for the $199 8G/$299 16G pricing. I had assumed that they would try to pull a fast one by saying that the iPhone populace wasn't far enough into their contracts to "deserve" the equipment upgrade because usually carriers like to crap on your heart---but I was wrong! I don't mind being wrong. Especially when less cash is involved. As a side note, AT&T was still really vague, almost to the point of insulting when I tried to get their guidelines regarding how someone usually "qualifies" for an upgrade. It was one of those situations where he kept repeating a sentence that wasn't answering my question and everytime I tried to make the question more specific he'd repeat it faster and louder, like people do when they want to let you know you're stupid. So for once I say, thank you, AT&T, for not screwing your current iPhone customer base! Doesn't it feel good to make the right decision? You heartless corporate monolith, you. It's the middle of the week and you're stuck at work. You're very close to branding your wrist with a hot paper clip just to break up the monotony. Why not make keylists on your iTunes?--"What the hell's that?" A keylist is what I call a keyword-based playlist. "But why not just throw it on shuffle?" You're interrupting again. It's impolite to interrupt. The reason is that the convenient automation of deprives you of the type of time-wasting distraction that you so desperately need, and you'll be forced to go back to GTD. Simply type in any string of letters into the search bar and hit play. The distraction comes from those, "...interesting..." moments you'll have when you see which tracks are word-related, listening to that handful of songs and then coming up with more. The periodic keywording will help break up your day by measuring it into spoonfuls of time, thereby tricking your brain. Aha! Take that, brain! Also, being able to quickly spot-check the list and revise it will help prevent those times when iTunes inevitably goes on a bad shuffle run when left to its own algorithms. Aha! Take that, randomness! Finally, because it doesn't waste too much continuous time (like hand-picking a playlist), you can actually get some work done. Aha! Take that, David Allen! I put up a screen shot from a list I got with the word, "can't," as in, "I can't believe I love Hall & Oates un-ironically." As you can see, it's quite a disparate grouping of music. Perfect for a distracting keylist! This is something I'm sure we've all done at one time or another but perhaps you just hadn't thought of it as "a thing." Or you had and I'm a jerk. Which element on the Periodic Table best defines you? Hydrogen? Magnesium? Gold? Nickel? You don't know, do you? That's because you haven't been onto Facebook and added the "What Element Are You?" app from the diligent team over at WIRED Science Labs. The show may have passed away but you'd never know it if you lived on Facebook! You (2007) - Facebook has apps! You (2008) - Facebook sure has a lot of apps. True, but this one is really fun. Working on a more complex model than "What kind of drunk are you," WiSci's braini-app allows you to not only define yourself elementally but to then take it one step further by forming compounds with your friends. Will you be table salt? Will you form a hydroxide? Will you create some new compound that by its very union defies the very laws of Nature itself? Because you are a sack of firecrackers with a "can-do" attitude, I'm confident you'll find out. By the way, I'm Sodium! *CREDITS: My friend Liz Burr over at KCET Interactive wrote the algorithm, while Princess Imoukhuede mapped out the elements and I wrote the content. The app was developed by Pure, Inc. and graphically designed by Nick La. WIRED Science Now On Hulu! I look very serious in this picture. Let's all just admit that. I'm "up to something." Clearly it's the kind of conspiratory hijinks one might find in an X Files or a Cold Case. Whatever the reason for the faux intensity, it shouldn't eclipse the fact that EVERY EPISODE of PBS's WIRED Science is now freely available on the digital broadcast museum of Hulu. Sadly, WiSci (as we call it in the WiSci biz) is never coming back to PBS because the flashy colors and forward-thinking science programming triggered pulmonary embolisms and uncontrolled urination in its core demographic, that being Elderly Cranks, 80-112 (as categorized by Nielsen Media). But their life loss is your life gain in the way of Edutainment! Now, you can get all of your favorite WIRED Science shows! Like, Episode 1! Episode 2! And who could forget that thing that happened in Episode 6! Don't forget, it's all FREE (a bargain at twice the price!)! Long live exclamation points!!! *WARNING: WIRED Science may inspire brain activity and feelings of "awesomeness." Pregnant women should consult their physician before prolonged viewing regarding Neuro-Fetal Ejection, a disorder which can occur when excessive levels of dopamine in the brain induce labor just to have someone to tell about the amazing thing that was just seen. Symptoms of NFE include acute verbal effusiveness and sudden childbirth. Whether you've recently been plucked out of your 19th century timestream and are trying to adapt to our technology's sterile aesthetic or you're just a busybody with a lot of free time and brass, the Steampunk Movement may be just the thing you're looking for to replace those annoying friends of yours that keep bugging you to get out of the house. Originally, this piece was supposed to air on WIRED Science but was cut for time. Now it airs exclusively anywhere you can imbed flash video. Dig Dug? In Pillow Form? YES. I. LOVE. THIS. This is the reason pillows exist. It's just so....right. As a young arcadesmith growing up in a bowling center, Dig Dug was my second favorite game closely behind Robotron 2084. I saw this on Engadget yesterday who in turn saw it on Craft's blog. It makes me proud when nerds force their other talents to express through the nerd prism. Now where are my got-damn Gorf doilies?? And can we flip out for a second on the awesome monkey quilt that is selflessly taking a back seat to those showboaty pillows? 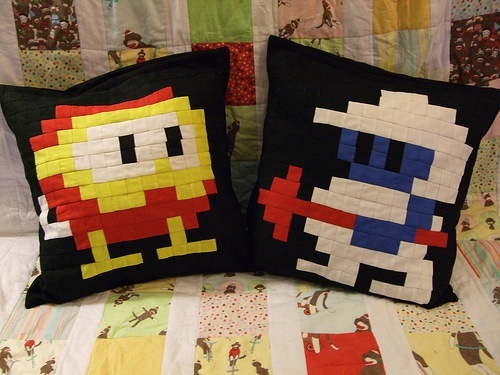 Unfortunately these selfish geeks aren't making Dig Dug pillows available for purchase, presumably because they hate money. This is from Friday's AOTS. I could have typed out this review, but talking really makes words come to life. 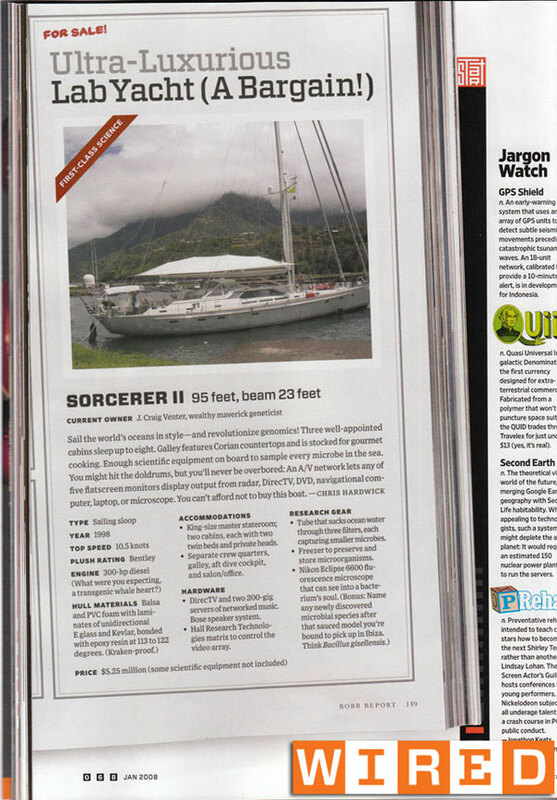 WIRED: Science Vessel For Sale! Yes, just as the title has promised, I am co-hosting AOTS today with Layla Kayleigh. Don't be disappointed that we're not Kevin and Olivia. We're still a white guy with tussled hair and an attractive exotic lady so your world won't be too upended. G4 is a channel that is a high number in your cable/sat line-up and aggregates the most fatty morsels of nerd culture.